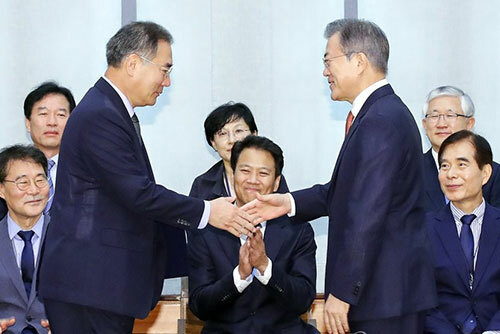 President Moon Jae-in appointed Lee Gae-ho as the new minister of agriculture, food and rural affairs on Friday following parliamentary endorsement. Deputy presidential spokeswoman Ko Min-jung said in a written briefing that President Moon presented Lee with a letter of appointment and asked for all-out efforts to stabilize agricultural prices ahead of next month’s Chuseok thanksgiving holiday. The president made this call while noting that livestock and fruit farmers have been hard hit by the drought and heat wave. He said that any resulting impact on the supply of produce will raise consumer prices. A parliamentary committee endorsed Lee’s nomination at a confirmation hearing on Thursday.